Traditional British prep schools were boarding schools, but day schools in recent years have become increasingly important. required an extensive system of boarding schools, confirming the character of many schools and swelling boarding rolls. The increasing affluence of the middle class created an expanding supply of parents who saw public school education as an important investment in their sons' futures and were able to afford school fees. Most considered a public school education to be a wise investment, ensuring comfortable futures for their sons. Public schools at the beginning of the 19th Century accepted a wide range of ages, including quite small boys--sometimes 8 or 9 years old and in exceptional cases even younger ones. For many of these younger children, public school proved to be nothing short of trial by ordeal. Their status at the bottom of the public school hierarchy was perilous indeed. The ample literature on the public schools describes such experiences in detail. Eton's Long Chamber; Harrow's initiatory ordeal of blanket toss, gauntlet, and "pinching"; Rugby's "lamb singing", roastings, and Anstey's hole; Westminster's kicking ordeals; and Winchester's "tin gloves" were just a few of the horrors perpetrated on junior boys. 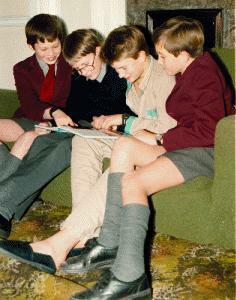 Educators increasingly realised that special provision had to be made for the needs of junior boys. The problem was compounded as the public schools expanded their rolls in the mid-19th Century and many new schools were founded. The fagging system theoretically offered some protection, but depended on the personality of the senior boys and the system was subject to great abuse. Some schools employed "dames" to care for the youngest students, housing them separately. Other public schools set up their own petty schools, qualifying perhaps as the earliest preparatory schools. Dr. Arnold at Rugby restricted entry to boys at least 12 years old in 1837-38, but most public schools did not immediately follow suit. Gradually in the latter half of the 19th Century, however, more and more schools narrowed the age range to 13-18 years. This specialisation by the public schools was a key factor in the rise during the mid-19th Century of a new educational institution--the fully independent preparatory school for young boys. Details on this historical development as well as some period photographs are in our book.